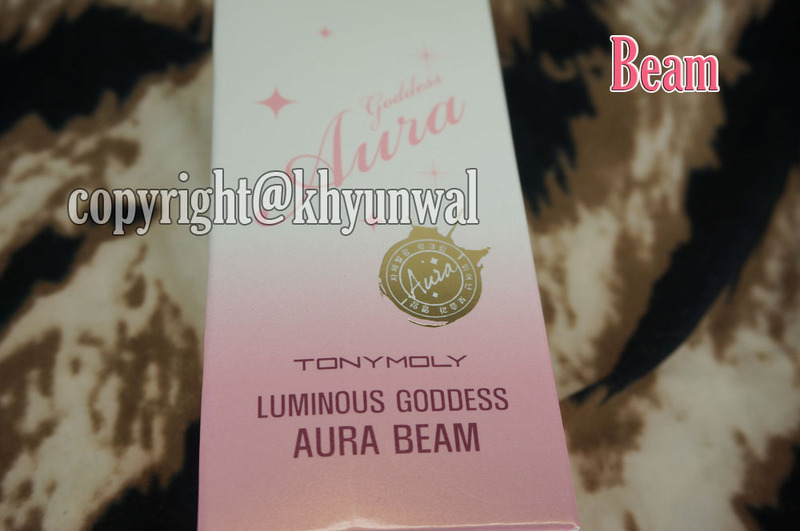 Today's review is going to be my favorite Korean Cosmetic Company, Tonymoly's Luminous Goddess Aura products. This product was really popular and was appointed #1 BB cream in 2012 when it came out. Tonymoly have lots of other base make-up product which is really popular, because of it's effects on the skin as well being reasonably cheap, compare to other company. To me, I thought Mist wasn't necessary, so I will be doing reviews of BB Cream and Beam. I will talk about all three products one by one. Goddess BB Cream has lots of advantage, that is the reason why it was appointed as #1 product of the year during 2012. Unlike other BB Cream, this product was one of the first product to have no darkening of the product after it has been used. Not only that, it has amazing coverage, moisturizing effect, have make-up primer within itself, skin care, and also sunscreen effect all-in-one! 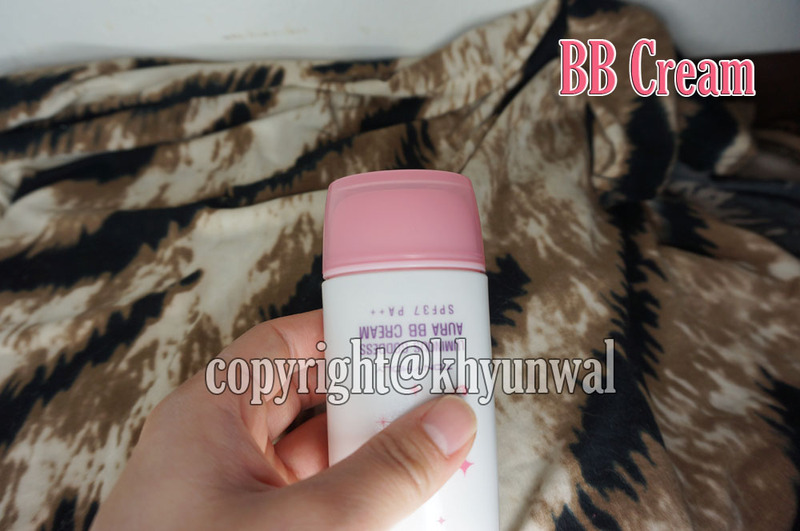 Also what I like about this product is that, compare to other BB cream that I have used which has grey base color most of the time, Goddess BB Cream actually has more of beige color which will blend into your skintone, and brighten up your complexion. to give more light to your face. But if you are those people with acne, oily, or have skin troubles, they recommend you to use only the BB Cream. I have the Gorgeous Beige, because that was only color at the time of I purchased this product. It is called Gorgeous Beige, because this is more lighter and whitens your skin more. I haven't used Calm Beige yet. But I believe that Calm Beige is called that way, cause it is more for people with darker skin tone. Second will be the Beam. 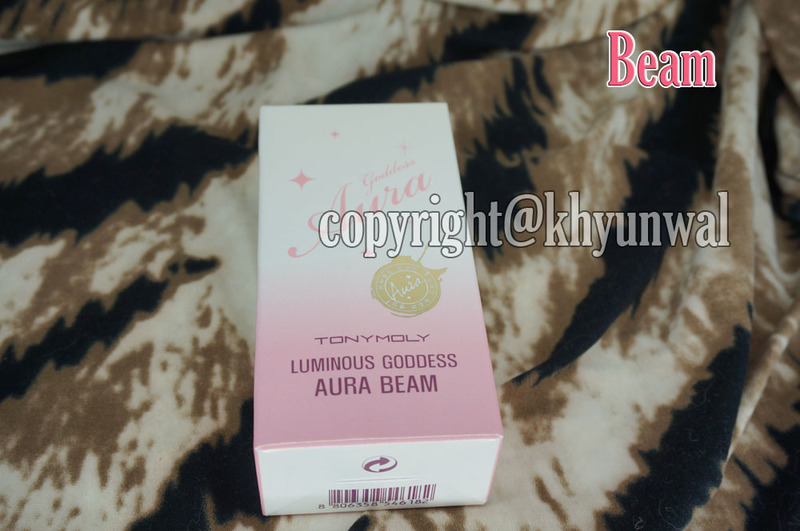 Goddess Beam is the product made for to give more light to your face. This can be used with any foundation or BB Cream of your choice and mix it together to apply. Main ingredient for this is argan oil, which will moisturize your skin. So this is highly recommended product to people who have dry skin. Last but not least, let's talk about the Mist. In Korea, many people use Mist (not necessarily have to be this particular one) to give more moisture to your skin throughout the day. And other reason is to prevent your make-up from being flaky. Goddess Mist is made out with 30% oil and 70% skin moisturizer. Oil is mixture of marine collagen, argan oil and olive oil, which are the known ingredients to give very effective moisturizing effect. Because of this ingredient, your skin will be instantly deeply moisturized by creating coat over your make-up. To use this, you simply shake the bottle to mix the ingredients and spray it either before or after you put your make-up on. You can also use this after you clean your face for skin care. Some people may not like the packaging of this product. But personally, I think it is very simple and cute. 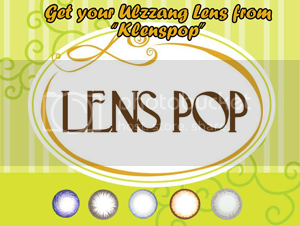 They are simple tube type of product, which is easy to control how much product you want to take out. 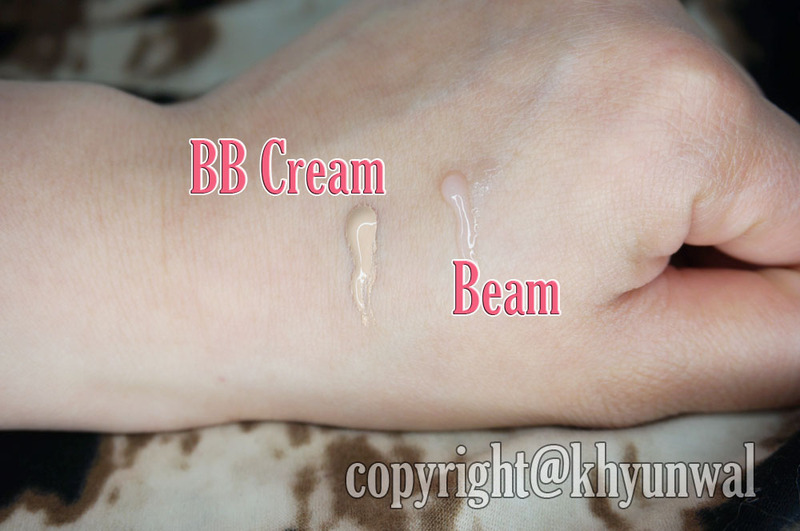 Beam is generally smaller than the BB Cream. I love the box of this product, I kind of collect certain make-up products' package if I love it so much. I thought it was really nice of Tonymoly to put description of the product in both Korean and English. Because I am sure that non-Korean speakers wants to know what is contained in the product when they purchase them. I have used this one product for more than 6 months! And because it is small and slim, it is easy to carry around in your make-up bag. It is really easy to open the cap, since it's simple twist cap. As I mentioned, this is tube type product. 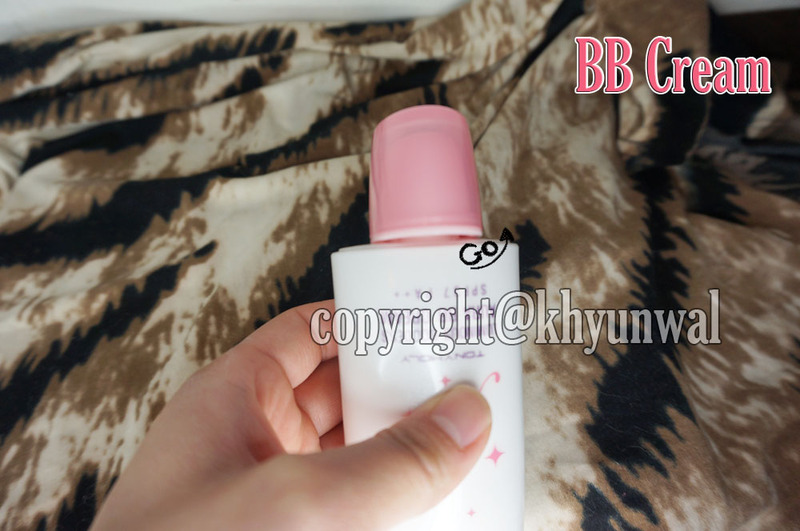 And since BB cream is more liquid type, you don't have to press the bottle too hard to get the product out. You can use very small amount of the BB Cream to cover up any blemish and flaws on the skin! 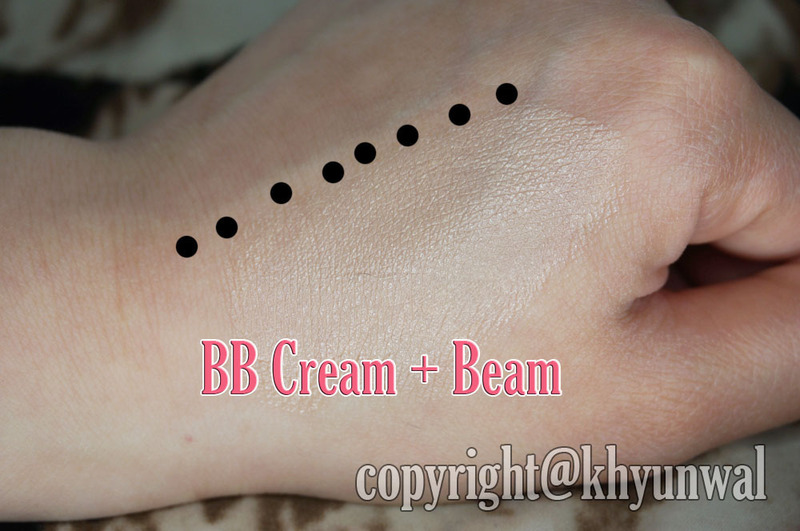 Compared to the BB Cream, Beam is little bit more harder to get it out. So you can press hard on the bottle for this one. And you only need half of the amount of the foundation or the BB cream you are using, to get moisturizing and shiny effect. 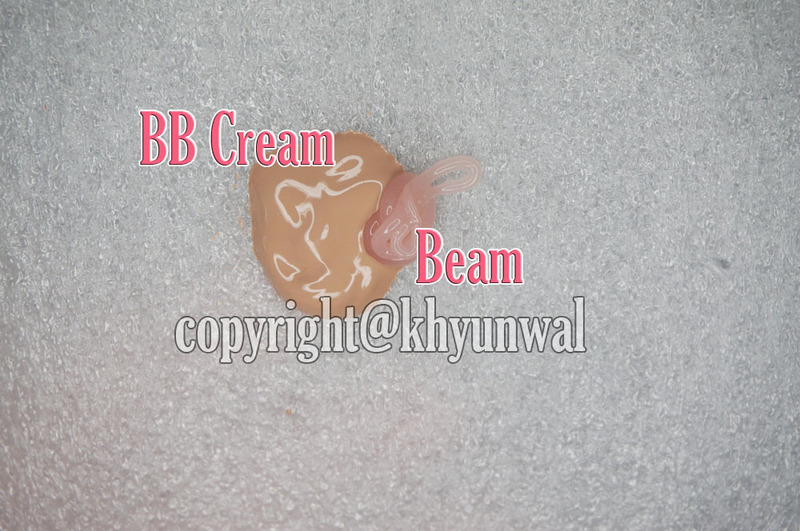 As you can see, BB cream has more of light beige color. Because of its color, it will blend into your skin really well, and doesn't make your face to appear super white or greyish, which other BB cream tends to do. And Beam has little bit of pink color to it. I think this will give more light and color to those people who are lack of color in their skin. This is blending test of each of them. 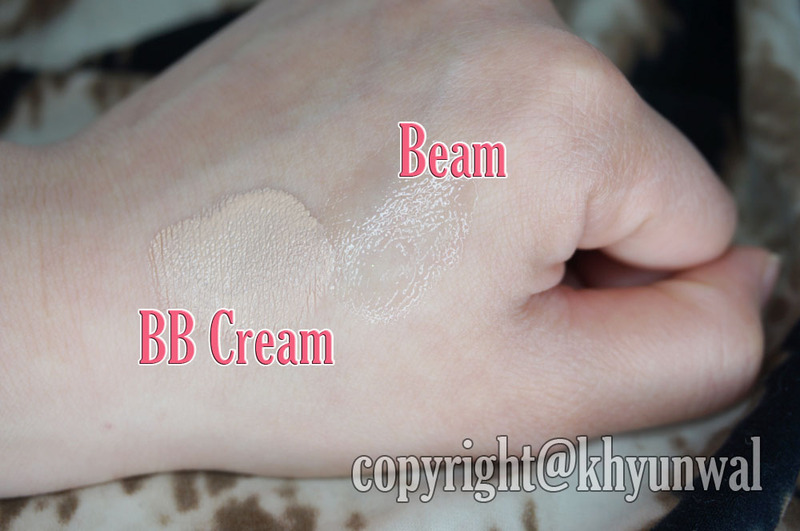 You can see that BB cream does great deal of coverage on the skin, and kind of have matte finished. And beam itself moisturized my skin, thus get more light to my skin. Now I blend these two together to show you guys the difference. And you can compare the coverage of it by looking at where product is applied on and where isn't. I accidentally put more BB cream then Beam, but you will want to have 1:2 ratio of each to get the right effect. As you can see, my skin before the application of product, it has quite some blemish and appear to be dark. But after application, my blemishes and flaws disappeared as well become more whitened. I am in love with this BB cream, although I have two other BB cream that I need to use. and I was quite disappointed how most of them turned grey after long time of wear. But this product stays really bright and fresh all day, without getting dark! If you are looking for reasonable priced and great BB Cream, this is must get! You can get this product at my sponsor W2Beauty for great price! For any questions and concern, feel free to leave a comment! P.S. Please everyone take a second to pray for South Korea. On 4/15/2014 on the same day Titanic sank... A ferry in South Korea heading for Jeju Island sank. The reason is still unknown. About 500 people were on board, and approximately 300 of them are junior class standing at Danwon High school on trip. About 180 passengers were saved, as of now 14 tragic death, and 300 people are missing. Pessoal, dica para quem quer comprar BB Cream no Brasil.